So many hints on this page. Secret society is full of secrets. That’s a wrap for this scene. With the next page, we shift to Fort Belfroi and what’s going on there. Vote for Snow by Nigh to see a preview of the page! Again one of my favorite spirits so far. I like her too. Beautiful, eloquent, and intense. I hope we’ll see more of her! What I really like about this is that while Cienan is being rebuked he is also not simply surrendering completely. The relationship is not one sided and that makes it far more interesting. Interesting development! Somehow I don’t think Cienan is out of his depth, just being made aware that he’s going to have to adjust his plans yet again. Giavere is at great risk, eh? That’s interesting! So Melaithe needs to be made whole? 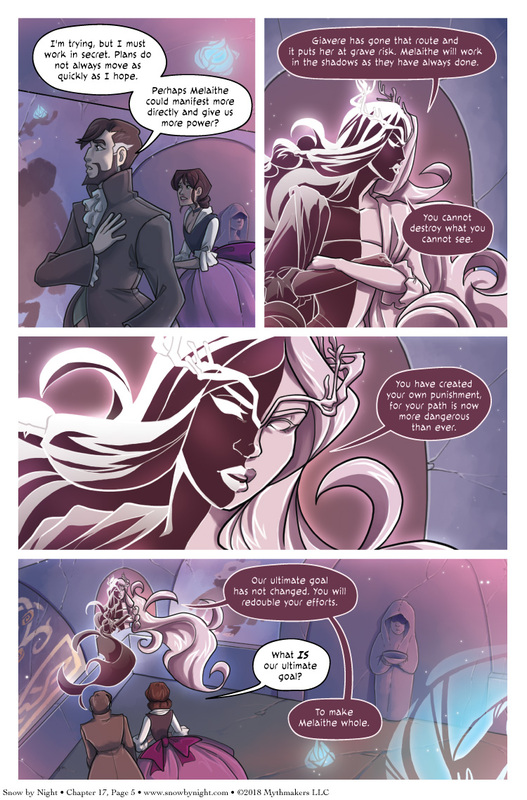 I notice that in the previous page we see Melaithe in two aspects, not speaking or hearing. In the background here we see a similar figure just holding a bowl. Does that one need to be re-integrated with the other two?